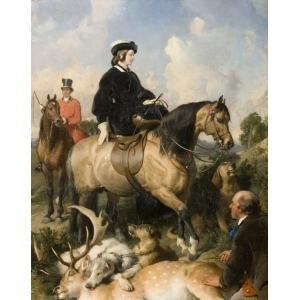 Summary: Oil painting showing Queen Victoria on horseback following a deer hunt. The gamekeeper sits at her feet by the dead deer showing the Queen his knife. 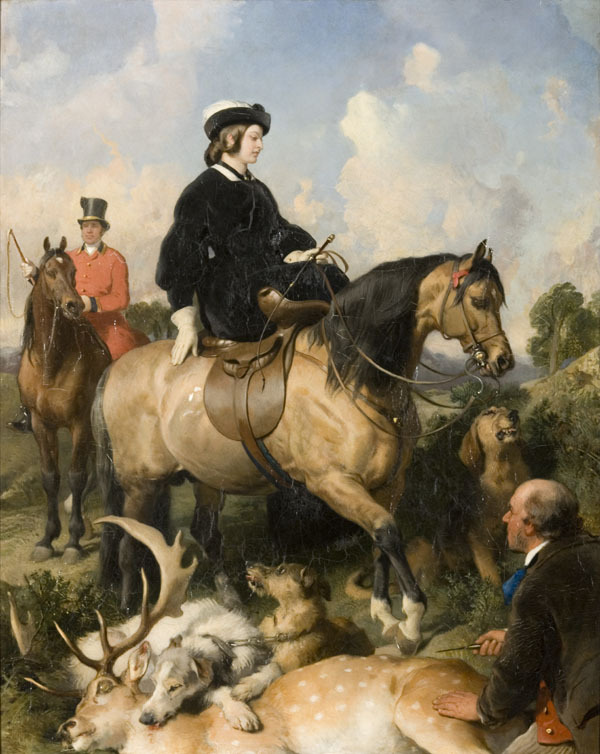 Description: In this painting, Queen Victoria is shown in Windsor Royal Park where a deer hunt has just taken place. The young Victoria has a majestic and dignified pose on horseback, dominating the picture. At her feet, a gamekeeper is showing her his knife, a traditional gesture of respect towards the owner of the deer. This picture was based on a sketch that Landseer drew thirty years earlier. The Queen, then middle-aged, did not like the painting and did not buy it. Victoria was upset that the painting showed her hunting without a female companion. This was something young Victorian women considered improper. Edwin Landseer: Landseer went to Scotland for the first time in 1824 and returned there regularly. He gained a reputation with the aristocracy and Royal Family, for whom he produced grand sporting paintings, set in the Highlands. He also painted portraits of their favourite horses and dogs, such as Prince Albert's greyhound and Victorias spaniel. He studied the animals anatomy as well as its character. He developed a new kind of genre painting employing animals as the principal subjects. In Scotland he also visited the author of Sir Walter Scott, and the influence of the novelist was to prove profound and long lasting. The popularity of Sir Walter Scott's novels contributed greatly to the Victorian fascination with Scottish history and landscape. Queen Victoria loved Scotland and spend a good deal of time at Balmoral, her home in the Highlands. Landseer creating many memorable portraits if the Queen and her court. His pictures are in the English tradition of informal, country-house conversation pieces, depicting the sitters in a natural way. This was in contrast to the 'larger than life' way that royalty was depicted by artists of the past. Queen Victoria did not like this portrait because it showed her out riding without a chaperone. In Victorian times it was not the done thing for a lady to go out unless escorted by her father, husband or female companion. She rejected the painting and it was returned to Landerr's studio. Edwin Landseer (1803-1873) was the son of an engraver. By the age of sixteen he was an active exhibitor at the Royal Academy, already patronised by leading collectors. He was elected a full Academician in 1831 and was knighted in in 1850. He was given the honour of a grand public funeral and was buried in St. Paul's Cathedral.